Almost everyone feels nervous or worried when they need to find a laptop screen repair service, and that’s why at Quick Fix Technologies, we work fast to get you up and running as soon as possible. Most of us depend on our laptops for work or school, and without a laptop, you won’t be able to get on with your business or studies. But don’t worry, a cracked or broken screen doesn’t necessarily mean that your laptop is a goner. In most cases, getting help from a repair professional is the quickest and safest way to get your laptop working again. We work with all models, including, but not limited to Apple, Asus, Acer, Dell, HP, Samsung, Sony and Toshiba. A laptop or notebook screen is often called an LCD, which means Liquid Crystal Display, the technology used in displays made for laptops and other small devices. LCDs make for very thin screens and sharp images. However, that light, thin screen is also very fragile, unfortunately, and cracked or broken displays are among the most repairs that we do. Whatever the problem, though, we can fix your LCD display. Keep in mind that if you’re having trouble with your screen after dropping it, it may not be a cracked screen after all. It might just be the graphics card. If you plug in your laptop and you get a picture, then the problem is likely just your screen. But if the picture is unclear, your graphics card might need replacing instead of, or in addition, to your screen. Also, if your glass cracked, but the image below it is fine, you may only need to have the touch screen (also known as the digitizer) replaced. If the image is broken or black, then you probably need to get the whole screen replaced. We specialize in the same day repairs and work with all makes and models. There are other screen failures that are possible, such as a failed inverter or back light, which result in a dark screen when you turn on your computer. Also, garbled images could mean that you have a bad graphics card. All our Laptop Repairs are done on site. We can help you find out what the problem is and fix your LCD fast. We are Quick Fix Technologies, a full-service computer and electronics repair and support company located in New York City. Quick Fix Technologies is conveniently located at 347 Fifth Avenue ste. 310 (between 33rd and 34st. st), right across from the Empire State Building. 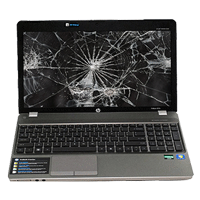 For fast laptop screen replacement in NYC, call 212-810-6432 or stop by today. We’ll be happy to repair your device fast so you can get back to normal in a flash.